Twelve 1965 Mustang convertibles were converted for use at the Magic Skyway at the 1964 Worlds Fair in New York. These replaced the twelve original early production 1964 Mustangs. Their VIN breakdown was: three Wimbledon White Mustangs (5F08T383380, 5F08T383382, 5F08T383386); three Raven Black Mustangs (5F08T383378, 5F08T383381, 5F08T383384), three Caspian Blue Mustangs(5F08T383375, 5F08T383377, 5F08T383383); and three Poppy Red Mustangs(5F08T383376, 5F08T383379, 5F08T383385). The serial number 83 Mustang never made it to the ride. 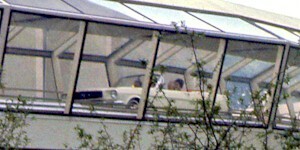 The second set of Mustangs converted for the Magic Skyway at the 1964 World's Fair where 1965 models. Twelve 1965 Mustang convertibles were sent to Carron & Company for conversion for the Disney designed ride. Eleven made it to the fair.